The Mercedes-Benz of Beverly Hills dealer near Culver City, CA, is your top source for great deals on new, used and certified pre-owned (CPO) Mercedes-Benz luxury cars and SUVs for sale near you. Plus, don’t forget to drop by our Certified Mercedes-Benz Service Center & Parts Department near Culver City. We take pride in handling all your local maintenance and repair needs. All services, including our popular Mercedes-Benz oil changes, tire rotations, brake checks, alignments, battery replacements and more, are provided by ASE Certified Mercedes-Benz mechanics. Our service center happily takes almost all makes and models. 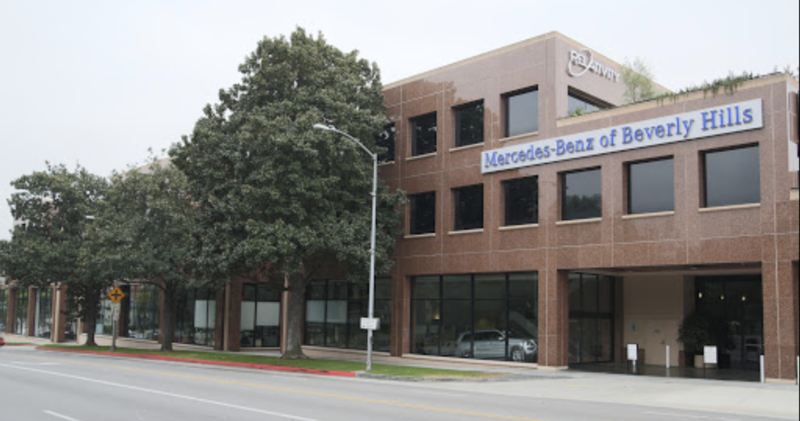 Why Choose the Mercedes-Benz of Beverly Hills Dealer Near Culver City? Mercedes-Benz of Beverly Hills invites you to our Mercedes-Benz dealership near Culver City, CA. We offer great Mercedes-Benz incentives, rebates, offers and lease deals on new, used and certified pre-owned Mercedes-Benz luxury cars and SUVs near Culver City. The deal you’ve been waiting for is just a phone call away. We are conveniently located near the intersection of Santa Monica Blvd & Beverly Blvd. Just 15 minutes away from Culver City. Just a few miles from the heart of Los Angeles is the Culver City in California. The city’s name is after the founder Harry Culver who founded the city in 1917. With over 39,000 denizens within its vicinity, Culver City is one of the densely populous cities nestled on the periphery of Los Angeles. The city also shares the LA County unincorporated-area with its neighbor cities. Being a neighbor to the famous Hollywood, Culver City has always been a center for filming and motion film shooting. Culver is home to the Metro- Goldwyn-Mayor Studios and the NFL Network studios and was the headquarter location for the Sony Pictures, Hughes Aircraft and the National Public Radio during the mid-1900s. The city is also home to The STAR Eco Station – a popular environmental science museum and a wildlife rescue center. The Wende Museum and Sony Pictures Studio Tour are two most popular Culver City attractions that visitors enjoy. And, all Hollywood and luxe Los Angeles attractions are just a few minutes drives away from the Culver City. With a high median-income and increasing rate of job opportunities, Culver City is one of the best places to live and work. The demand for automobiles is rising due to the daily commuters’ growing needs for cars. Mercedes-Benz of Beverly Hills is well-known for the quality of our Mercedes-Benz luxury cars and SUVs for sale in the Culver City, CA area. Time and time again, customers choose us for our fantastic selection, competitive pricing, and quality of customer care and service. You’ll love the easy access to our new & used vehicle inventory online, as well as our team of friendly, knowledgeable team members. Whether helping you to find the best Mercedes-Benz lease deal near Culver City, the right factory rebate, or any available incentives, they are happy to help. We believe that car buying doesn’t have to be a stressful experience. Come discover the best Mercedes-Benz deal for you near Culver City. Schedule your Culver City Mercedes-Benz service online, or call us to make an appointment at your earliest convenience. Your search for the best new car special offers and Mercedes-Benz lease deals near Culver City is over. Once you’ve found the perfect vehicle, our Mercedes-Benz finance specialists will help get you the best auto loan or lease deal in the Culver City CA area. Contact us today, and make sure you ask about our current Mercedes-Benz finance offers, specials and incentives.